in 1979, ColorGraphics Weather Systems pioneered the use of color computer graphics in television weather forecasts, using the Apple II computer? despite being a clone of the Apple II, the Soviet Agat computer cost as much as twenty times the average monthly Soviet salary? The 1977 Apple II, shown here with floppy disk drives and a monitor. The Apple II featured an integrated keyboard, sound, a plastic case, and eight internal expansion slots. The Apple II (often rendered Apple ][ or Apple //) was one of the first highly successful mass produced microcomputer products, designed primarily by Steve Wozniak, manufactured by Apple Computer (now Apple Inc.) and introduced in 1977. In terms of ease of use, features and expandability the Apple II was a major technological advancement over its predecessor, the Apple I, a limited production bare circuit board computer for electronics hobbyists which pioneered many features that made the Apple II a commercial success. Introduced at the West Coast Computer Faire in 1977, the Apple II was among the first successful personal computers and responsible for launching the Apple company into a successful business (and for allowing several related companies to start at all). Throughout the years, a number of different models were introduced and sold, with the most popular model manufactured having relatively minor changes even into the 1990s. By the end of its production in 1993, somewhere between five and six million Apple II series computers (including approximately 1.25 million Apple IIGS models) had been produced. The Apple II became one of the most recognizable and successful computers during the 1980s and early 1990s. It was aggressively marketed through volume discounts and manufacturing arrangements to educational institutions which resulted in it being the first computer in widespread use in American secondary schools. A focused effort to develop educational and business software for the Apple II, including the 1979 release of the popular VisiCalc spreadsheet, made the computer especially popular with business users and families. The original Apple II operating system was only the built-in BASIC interpreter contained in ROM; most commercial Apple II software on disk, e.g. educational games and productivity programs, booted directly on the hardware and either had no operating system or incorporated one of its own (which was usually invisible to the user.) The Apple DOS Disk Operating System was added to support the diskette drive; the last version was "Apple DOS 3.3". Apple DOS was superseded by ProDOS, which supported a hierarchical filesystem and larger storage devices. With an optional third-party Z80 based expansion card the Apple II could boot into the CP/M operating system and run WordStar, dBase II, and other CP/M software. At the height of its evolution, towards the late 1980s, the platform had the graphical look of a hybrid of the Apple II and Macintosh with the introduction of the Apple IIGS. By 1992 the platform had 16-bit processing capabilities, a mouse-driven Graphical User Interface, and graphic and sound capabilities far beyond the original. Despite the introduction of the Motorola 68000-based Apple Lisa system in 1983, and its more successful cousin the Macintosh in 1984, the relatively unsophisticated Apple II series was Apple's primary revenue source for most of the following decade: with its associated community of third-party developers and retailers it was once a billion-dollar-a-year industry. The Apple IIGS was sold until the end of 1992; the last II-series Apple in production, the IIe, was discontinued on October 15, 1993. The Apple II was designed to look more like a home appliance than a piece of electronic equipment. The lid popped off the beige plastic case without the use of tools, allowing access to the computer's internals, including the motherboard with eight expansion slots, and an array of random access memory (RAM) sockets which could hold up to 48 kilobytes worth of memory chips. The Apple II had color and high-resolution graphics modes, sound capabilities and one of two built-in BASIC programming languages (initially Integer BASIC, later Applesoft BASIC). The Apple II was targeted for the masses rather than just hobbyists and engineers; its introduction and subsequent popularity also greatly influenced most of the microcomputers that followed it. In this context, one of the main meanings of "not just for hobbyists and engineers" is that, unlike preceding home microcomputers, it was sold as a finished consumer appliance rather than as a kit (unassembled or preassembled). VanLOVEs Apple Handbook and The Apple Educators Guide by Gerald VanDiver and Rolland Love reviewed more than 1,500 software programs that the Apple II series could use. The Apple dealer network used this book to emphasize the growing software developer base in education and personal use. Most of the Apple II series had a keyboard built-in to the motherboard shell. The exception to this was the Apple IIGS which was not originally designed with a built-in keyboard. An upgrade kit was sold later to house the motherboard of an Apple IIGS in an Apple IIe case. Early II-series models were usually designated "Apple ]["; later models "Apple //", plus a letter suffix. The first Apple II computers went on sale on June 5, 1977 with a MOS Technology 6502 microprocessor running at 1 MHz, 4 kB of RAM, an audio cassette interface for loading programs and storing data, and the Integer BASIC programming language built into the ROMs. The video controller displayed 24 lines by 40 columns of monochrome, upper-case-only (the original character set matches ASCII characters 0x20 to 0x5F) text on the screen, with NTSC composite video output suitable for display on a TV monitor, or on a regular TV set by way of a separate RF modulator. The original retail price of the computer was US$1298 (with 4 kB of RAM) and US$2638 (with the maximum 48 kB of RAM). To reflect the computer's color graphics capability, the Apple logo on the casing was represented using rainbow stripes, which remained a part of Apple's corporate logo until early 1998. The earliest Apple II's were assembled in Silicon Valley, and later in Texas; printed circuit boards were manufactured in Ireland and Singapore. An external 5¼-inch floppy disk drive, the Disk II, attached via a controller card that plugged into one of the computer's expansion slots (usually slot 6), was used for data storage and retrieval to replace cassettes. The Disk II interface, created by Steve Wozniak, was regarded as an engineering masterpiece at the time for its economy of electronic components. While other controllers had dozens of chips for synchronizing data I/O with disk rotation, seeking the head to the appropriate track, and encoding the data into magnetic pulses, Wozniak's controller card had few chips; instead, the Apple DOS used software to perform these functions. The Group Code Recording used by the controller was simpler and easier to implement in software than the more common MFM. In the end, the low chip count of the controller contributed to making Apple's Disk II the first affordable floppy drive system for personal computers. As a side effect, Wozniak's scheme made it easy for proprietary software developers to copy-protect the media on which their software shipped by changing the low-level sector format or stepping the drive's head between the tracks; inevitably, other companies eventually sold software to foil this protection. Another Wozniak optimization allowed him to omit Shugart's Track-0 sensor. When the Operating System wants to go to track 0, the controller simply moves forty times toward the next-lower-numbered track, relying on the mechanical stop to prevent it going any further down than track 0. This process, called "recalibration", made a loud buzzing (rapid mechanical chattering) sound that often frightened Apple novices. The approach taken in the Disk II controller was typical of Wozniak's design sensibility. The Apple II used several engineering shortcuts to save hardware and reduce costs. For example, taking advantage of the way that 6502 instructions only access memory every other clock cycle, the video generation circuitry's memory access on the otherwise unused cycles avoided memory contention issues and also eliminated the need for a separate refresh circuit for the DRAM chips. Rather than using a complex analog-to-digital circuit to read the outputs of the game controller, Wozniak used a simple timer circuit whose period was proportional to the resistance of the game controller, and used a software loop to measure the timer. The text and graphics screens had a somewhat outdated arrangement (the scanlines were not stored in sequential areas of memory) which was reputedly due to Wozniak's realization that doing it that way would save a chip; it was less expensive to have software calculate or look up the address of the required scanline than to include the extra hardware. Similarly, in the high-resolution graphics mode, color was determined by pixel position and could thus be implemented in software, saving Wozniak the chips needed to convert bit patterns to colors. This also allowed for sub-pixel font rendering since orange and blue pixels appeared half a pixel-width further to the right on the screen than green and purple pixels. Color on the Apple II series took advantage of a quirk of the NTSC television signal standard, which made color display relatively easy and inexpensive to implement. The original NTSC television signal specification was black-and-white. Color was tacked on later by adding a 3.58 MHz subcarrier signal that was partially ignored by B&W TV sets. Color is encoded based on the phase of this signal in relation to a reference color burst signal. The result is that the position, size, and intensity of a series of pulses define color information. These pulses can translate into pixels on the computer screen. The Apple II display provided two pixels per subcarrier cycle. When the color burst reference signal was turned on and the computer attached to a color display, it could display green by showing one alternating pattern of pixels, magenta with an opposite pattern of alternating pixels, and white by placing two pixels next to each other. Later, blue and orange became available by tweaking the offset of the pixels by half a pixel-width in relation to the colorburst signal. The high-resolution enhanced display offered more colors simply by compressing more, narrower pixels into each subcarrier cycle. The coarse, low-resolution graphics display mode worked differently, as it could output a short burst of high-frequency signal per pixel to offer more color options. The epitome of the Apple II design philosophy was the Apple II sound circuitry. Rather than having a dedicated sound-synthesis chip, the Apple II had a toggle circuit that could only emit a click through a built-in speaker or a line out jack; all other sounds (including two, three and, eventually, four-voice music and playback of audio samples and speech synthesis) were generated entirely by software that clicked the speaker at just the right times. Not for nearly a decade would an Apple II be released with a dedicated sound chip. Similar techniques were used for cassette storage: the cassette output worked the same as the speaker, and the input was a simple zero-crossing detector that served as a relatively crude (1-bit) audio digitizer. Routines in the ROM were used to encode and decode data in frequency-shift keying for the cassette. Wozniak's open design and the Apple II's multiple expansion slots permitted a wide variety of third-party devices to expand the capabilities of the machine. Apple II peripheral cards such as Serial controllers, improved display controllers, memory boards, hard disks, and networking components were available for this system in its day. There were plug-in expansion cards, such as the Z80-card, that permitted the Apple to use the Z80 processor and run a multitude of programs developed under the CP/M operating system, including the dBase II database and the WordStar word processor. There was also a third-party 6809 card that would allow OS-9 Level One to be run. The Mockingboard sound card greatly improved the audio capabilities of the Apple, with simple music synthesis and text-to-speech functions. Eventually, Apple II accelerator cards were created to double or quadruple the computer's speed. The Apple II Plus, introduced in June 1979, included the Applesoft BASIC programming language in ROM. This Microsoft-authored dialect of BASIC, which was previously available as an upgrade, supported floating-point arithmetic, and became the standard BASIC dialect on the Apple II series (though it ran at a noticeably slower speed than Steve Wozniak's Integer BASIC). The Apple II Plus was otherwise identical to the original Apple II. The smaller memory sizes were no longer available, so the II Plus always had a total of 48 kB of RAM, expandable to 64 kB by means of the "language card", a 16 kB RAM expansion card that could be installed in the computer's slot 0. The Apple's 6502 microprocessor could support a maximum of 64 kB of memory, and a machine with 48 kB RAM reached this limit because of the additional 12 kB of read-only memory and 4 kB of I/O addresses. For this reason, the extra RAM in the language card was bank-switched over the machine's built-in ROM, allowing code loaded into the additional memory to be used as if it actually were ROM. Users could thus load Integer BASIC into the language card from disk and switch between the Integer and Applesoft dialects of BASIC with DOS 3.3's INT and FP commands just as if they had the BASIC ROM expansion card. The language card was also required to use the UCSD Pascal and FORTRAN 77 compilers, which were released by Apple at about the same time. These ran under the UCSD p-System operating system, which had its own disk format and emitted code for a "virtual machine" rather than the actual 6502 processor. The UCSD P-system had a curious approach to memory management, which became even more curious on the Apple III. A TEMPEST approved version of the Apple II Plus called the Microfix was developed in 1980 by the Georgia Tech Research Institute for U.S. Army FORSCOM. Fielded in 1982, the Microfix system was the first tactical system using video disk (Laserdisk) map technology providing zoom and scroll over map imagery coupled with a point database of intelligence data such as order of battle, airfields, roadways, and bridges. After the success of the first Apple II in the United States, Apple expanded its market to include Europe, Australia and the Far East in 1978, with the Apple II Europlus (Europe, Australia) and the Apple II J-Plus (Japan). In these models, Apple made the necessary hardware, software and firmware changes in order to comply to standards outside of the U.S. The power supply was modified to accept the local voltage, and in the European and Australian model the video output signal was changed from color NTSC to monochrome PAL — an extra video card was needed for color PAL graphics, since the simple tricks Wozniak had used to generate a pseudo-NTSC signal with minimal hardware didn't carry over to the more complex PAL system. In the Japanese version of the international Apple, the keyboard layout was changed to allow for Katakana writing (full Kanji support was clearly beyond the capabilities of the machine), but in most other countries the international Apple was sold with an unmodified American keyboard; thus the German model still lacked the umlauts, for example. For the most part, the Apple II Europlus and J-Plus were identical to the Apple II Plus. Production of the Europlus ended in 1983. An Apple IIe with DuoDisk and Monitor //. Introduced with the IIe was the DuoDisk, essentially two Disk II 5¼-inch drives in a single enclosure designed to stack between the computer and the monitor, and a new controller card to run it. This controller was (by design) functionally identical to the original Disk II controller but used a different connector, allowing a single cable to control both drives in the DuoDisk. The DuoDisk was plagued by reliability problems, however, and did not catch on as well as the Apple IIe itself. The Apple IIc was Apple's first compact and portable computer. The Apple IIc was the first Apple II to use the 65C02 low-power variant of the 6502 processor, and featured a built-in 5.25-inch floppy drive and 128 kB RAM, with a built-in disk controller that could control external drives, composite video (NTSC or PAL), serial interfaces for modem and printer, and a port usable by either a joystick or mouse. Unlike previous Apple II models, the IIc had no internal expansion slots at all, this being the means by which its compact size was attained. Third parties did eventually figure out how to wedge up to 1 MB of additional memory and a real-time clock into the machine, and a later revision of the motherboard provided an expansion slot that could accept an Apple memory card bearing up to 1 MB of RAM. The disk port, originally intended for a second 5¼-inch floppy drive, eventually was able to interface to 3½-inch disk drives and (via third parties) even hard disks. To play up the portability, two different monochrome LCD displays were sold for use with the IIc's video expansion port, although both were short-lived due to high cost and poor legibility. (An Apple IIc with the smaller of these displays appeared briefly in the film 2010.) The IIc had an external power supply that converted AC power to 12 Volts DC, allowing third parties to offer battery packs and automobile power adapters that connected in place of the supplied AC adapter. The Apple IIc (in its American version) was the first microcomputer to include support for the Dvorak Simplified Keyboard, which was activated using a switch above the keyboard. This feature was also later found in late-model American Apple IIe computers (though the switch was inside the computer) and in the Apple IIGS (accessible via the built-in control panel). The international models used the same mechanism to switch between the localized and the American keyboard layouts, but did not offer Dvorak. The Apple IIGS, the most powerful Apple II, featuring a true 16-bit CPU, 4096 colors, Ensoniq synthesizer, a Mac-like GUI and a mouse. The Apple IIGS setup, with keyboard and mouse shown. The next member of the line was the Apple IIGS computer, released in September 15, 1986. A radical departure from the existing Apple II line, the IIGS featured a true 16-bit microprocessor, the 65C816, operating at 2.8 MHz with 24-bit addressing, allowing expansion up to 8 MB of RAM without the bank-switching hassles of the earlier machines (RAM cards with more than 4 MB were never directly supported by Apple). It introduced two completely new graphic modes sporting higher resolutions and a palette of 4,096 colors; however, only 4 (at 640×200 resolution) or 16 (at 320×200 resolution) colors could be used on a single line at a time, although a technique known as dithering was often employed in software to increase the number of perceived colors. In a departure from earlier Apple II graphics modes, the new modes laid out the scanlines sequentially in memory. However, programmers in search of a graphics challenge could always turn to 3200-color mode, which involved precisely swapping in a different 16-color palette for each of the screen's 200 scanlines as the monitor's electron beam traced the screen line by line. This exotic technique did not leave many CPU cycles available for other processing, so this "mode" was best suited to displaying static images. The Apple IIGS stood out from any previous (or future) Apple II models, evolving and advancing the platform into the next generation of computing while still maintaining near-complete backward compatibility. The secret of the Apple IIGS's compatibility was a single chip called the Mega II, which contained the functional equivalent of an entire Apple IIe computer (sans processor). This, combined with the flawless 65C02 emulation mode of the 65C816 processor, provided full support for legacy software. The computer also included a 32-voice Ensoniq 5503, 'wavetable' sample-based music synthesizer chip with 64 kB dedicated RAM, 256 kB of standard RAM, built-in peripheral ports (switchable between IIe-style card slots and IIc-style onboard controllers for disk drives, mouse, RGB video, and serial devices), built-in AppleTalk networking, and a ROM toolbox that supported a graphical user interface derived from the Macintosh toolbox. The computer could run existing 8-bit Apple II software (including software written for the very first Apple II in Integer BASIC), but also supported 16-bit software running under a new OS first called ProDOS 16 and later called GS/OS. The new OS eventually included a Finder that could be used for managing disks and files and opening documents and applications, along with desk accessories — just like the Macintosh. The 16-bit operating system would automatically switch to the text display and downshift to 8-bit mode to run legacy software, while offering a consistent, Macintosh-like graphical interface for native 16-bit applications. Eventually the IIGS gained the ability to read and write Macintosh disks and, through third-party software, even multitasking (both cooperative and preemptive, the latter in the form of a Unix-type shell), outline TrueType font support, and in one case, even real-time 3D gaming using texture mapping. The first 50,000 Apple IIGS computers came with Steve Wozniak's "Woz" signature silkscreened on the front and were referred to as the "Woz Limited Edition". These machines are not functionally different from machines from the same time period without the signature. The Apple IIc Plus, an 8-bit revision of the original portable but with faster CPU, 3½-inch floppy and built-in power supply. It was the last of the Apple II line. The final Apple II model was the Apple IIc Plus introduced in 1988. It was the same size and shape as the IIc that came before it, but the 5¼-inch floppy drive had been replaced with a 3½-inch drive, the power supply was moved inside (gone was the IIc's "brick on a leash" power supply), and the processor was a fast 4 MHz 65C02 processor that actually ran 8-bit Apple II software faster than the IIGS. (Third-party accelerators for other models could, however, go as fast as 10 MHz, and IIGS accelerators would eventually reach 16 MHz.) The IIc Plus's accelerator was derived from a design licensed from Zip Technologies, a third-party maker of accelerators for the Apple II, though Apple used separate chips instead of combining the processor, cache, and supporting logic on a multi-chip module as did Zip. Like later models of the original Apple IIc, the IIc Plus included a memory expansion slot that would accept a daughter-card carrying up to a megabyte of RAM. The IIc Plus also featured a new keyboard layout that matched the Platinum IIe and IIGS. Unlike the IIe, IIc and IIGS, the IIc Plus came only in one version (American) and was not officially sold anywhere outside the USA. Many perceived the IIc Plus as Apple's attempt to compete with the Laser 128EX/2, a popular third party Apple-compatible machine that also had an accelerated processor and a built-in 3½-inch drive. There were few other rational explanations for Apple expending resources on the continued development of a new 8-bit Apple II model rather than furthering the 16-bit Apple IIGS. However, with its 3½-inch drive and speedy processor, it was an excellent, compact machine for running the AppleWorks integrated productivity package, especially with the 1 MB memory upgrade. Although not an extension of the Apple II line, in 1990 the Apple IIe Card, an expansion card for the LC line of Macintosh computers, was released. Essentially a miniaturized Apple IIe computer on a card (using the Mega II chip from the Apple IIGS), it allowed the Macintosh to run 8-bit Apple IIe software through hardware emulation (although video was emulated in software and was slower at times than a IIe). Many of the LC's built-in Macintosh peripherals could be "borrowed" by the card when in Apple II mode (i.e. extra RAM, 3½-inch floppy, AppleTalk networking, hard disk). The IIe card could not, however, run software intended for the 16-bit Apple IIGS. The Macintosh LC with IIe Card was intended to replace the Apple IIGS in schools and homes and was presumably the reason a new model Apple IIGS that was confirmed by insiders to be in development at one point was cancelled and never released. Apple's Macintosh product line finally eclipsed the Apple II in the early 1990s. Even after the Macintosh's introduction, the Apple II had remained the company's primary revenue source for years. The computer was the first to attract a loyal user community and many outspoken Apple II fans were bitter that the company had invested its Apple II profits into the Macintosh rather than using them to further the Apple II series. Apple continued to sell Apple II systems alongside the Macintosh until terminating the IIGS in December, 1992  and the IIe in November, 1993. Mike Markkula, a retired Intel salesman who provided early critical funding for Apple Computer, was keen on marketing. From 1977 until 1981 Apple used the Regis McKenna agency for its advertisements and marketing. In 1981, Chiat-Day acquired Regis McKenna's advertising operations and Apple used Chiat-Day. At Regis McKenna Advertising, the team assigned to launch the Apple II consisted of Rob Janoff, art director, Chip Schafer, copywriter and Bill Kelley, account executive. Janoff came up with the Apple logo with a bite out of it. The design was originally an olive green with matching company logotype all in lower case. Steve Jobs insisted on promoting the color capability of the Apple II by putting rainbow stripes on the Apple logo. In its letterhead and business card implementation, the rounded "a" of the logotype echoed the "bite" in the logo. This logo was developed simultaneously with an advertisement and a brochure; the latter being produced for distribution initially at the first West Coast Computer Faire. Ever since the original Apple II, Apple has paid high attention to its quality of packaging, partly because of Steve Jobs' personal preferences and opinions on packaging and final product appearance. All of Apple's packaging for the Apple II series looked similar, featuring lots of clean white space and showing the Apple rainbow logo prominently. For several years up until the 1980s, Apple used the Motter Tekkura font for packaging, until changing to the Apple Garamond font. Apple ran the first advertisement for the Apple II in the July 1977 edition of Byte — a two page spread ad titled "Introducing the Apple II" and followed by a third page that was an order form. The first brochure, was entitled "Simplicity" and the copy in both the ad and brochure pioneered "demystifying" language intended to make the new idea of a home computer more "personal." The Apple II introduction ad was later run in the September 1977 issue of Scientific American. Apple later aired eight television commercials for the Apple IIGS, emphasizing its benefits to education and students, along with some print ads. Towards the end of 1982, art director Brent Thomas and Steve Hayden came up with the idea of doing an advertising campaign based on the timely tagline "Why 1984 won't be like 1984". Chiat-Day shopped it around to a number of clients, including Apple, where it was proposed to be used for a print ad in the Wall Street Journal promoting the Apple II. However, Apple did not go for it, and the idea was filed away until the spring of 1983, when they met with the Macintosh marketing team to start working on the launch, which was scheduled for January 1984. The idea eventually became the famous 1984 commercial which aired during the third quarter at Super Bowl XVIII. The Jiama (嘉馬) SPS-109, a Taiwanese clone of the Apple II, looks almost identical to the Apple II and II+, including an identical case, color and keyboard layout. The only noticeable physical difference is the label above the keyboard. The Apple II was frequently cloned, both in the United States and abroad - similar cloning of the IBM PC later occurred. According to some sources (see below), more than 190 different models of Apple II clones were manufactured. Many of these had "fruit" names (e.g. "Pineapple") to indicate to the initiated that they were Apple II clones. Well-known in the Soviet Bloc were the Agat, an oversized Russian Apple II clone with a Cyrillic character set, and Bulgarian Pravetz series 8, a close Apple II replica with Cyrillic support. Basis, a German company, created the Basis 108, a clone for the Apple II that included both a 6502 processor and the Zilog Z80, allowing it to run the CP/M operating system as well as most Apple II software. This machine was unusual in that it was housed in a heavy cast-iron chassis. The Basis 108 was equipped with built-in Centronics (parallel) and RS232c (serial) ports, as well as the standard six Apple II compatible slots. Unlike the Apple II it came with a detached full-stroke keyboard (AZERTY/QWERTY) of 100 keys plus 15 functions keys and separate numeric and editing keypads. A Bosnian (at the time part of communist Yugoslavia) company named IRIS Computers (sub company of biggest electric company in Bosnia and Herzegovina and Yugoslavia ENERGOINVEST) has produced Apple II clones since the early 1980s. Their official brand name was IRIS 8. They were very expensive and hard to obtain and were produced primarily for usage in early computerized digital telephone systems and for education. Their usage in offices of the state companies, R&D labs and in the Yugoslav army was also reported. IRIS 8 had looks of early IBM PCs — separate central unit with cooling system and two 5¼-inch disks, monitor and keyboard. Compatibility with original Apple II was complete. Elite high schools in Yugoslavia and especially Bosnia and Herzegovina were equipped with clusters of 8, 16 or 32 IRIS 8 computers connected in local network administrated by IRIS 16 PC clone. The number of IRIS 8's produced could be as many as a couple of tens of thousands. An Australian-produced clone of the Apple II was the Medfly, named after the Mediterranean fruit fly that attacks apples. The Medfly computer featured a faster processor, more memory, detached keyboard, lower and upper case characters and a built-in disk controller. Unitron, a Brazilian company, produced another clone, named ApII. Unitron used a copy of the Apple's ROM translated to Portuguese. The operating system was Apple's DOS 3.3 translated to Portuguese. During this period, it was illegal to import microcomputers in Brazil, and buying those (illegal) clones was the only way to have a microcomputer. Unitron stopped manufacturing the ApII a few years after the introduction of IBM PC clones in Brazil. The Ace clones from Franklin Computer Corporation are the best known and had the most lasting impact, as Franklin copied Apple's ROMs and software and freely admitted to doing so. Franklin's argument: a computer's ROM was simply a pattern of switches locked into a fixed position, and one cannot copyright a pattern of switches. Apple fought Franklin in court for about five years to get its clones off the market, and was ultimately successful when a court ruled that software stored in ROM was in fact copyrightable in the United States. (See Apple Computer, Inc. v. Franklin Computer Corp.) Franklin later released non-infringing but less-compatible clones; these could run ProDOS and AppleWorks and had an Applesoft-like BASIC, but compatibility with other software was hit-or-miss. Apple also challenged VTech's Laser 128, an enhanced clone of the Apple IIc first released in 1984, in court. This suit proved less fruitful for Apple, because VTech had reverse-engineered the Monitor ROM rather than copying it and had licensed Applesoft BASIC from its creator, Microsoft. Apple had neglected to obtain exclusive rights to the Applesoft dialect of BASIC from Microsoft; VTech was the first cloner to license it. The Laser 128 proved popular and remained on the market for many years, both in its original form and in accelerated versions that ran faster than 1 MHz. Although it wasn't 100 percent compatible with the Apple II, it was close, and its popularity ensured that most major developers tested their software on a Laser as well as on genuine Apple machines. Because it was frequently sold via mail order and mass-market retailers such as Sears, the Laser 128 may have cut into the sales of low-cost competitors such as Commodore Business Machines as much as it did Apple's. While the first Apple II clones were generally exact copies of their Apple counterparts that competed mainly on price, many clones had extra capabilities too. A Franklin model, the Ace 1000, sported a numeric keypad and lower-case long before these features were added to the Apple II line. The Laser 128 series is sometimes credited with spurring Apple to release the Apple IIc Plus; the built-in 3½-inch drive and accelerated processor were features Laser had pioneered. The Laser 128 also had a IIe-style expansion slot on the side that could be used to add peripheral cards. Bell & Howell, an audiovisual equipment manufacturer whose products (particularly film projectors) were ubiquitous in American schools, offered what appeared at first glance to be an Apple II Plus clone in a distinctive black plastic case. However, these were in fact real Apple II Plus units manufactured by Apple for B&H for a brief period of time. Many schools had a few of these Black Apple or Black "Darth Vader" Apples in their labs. ITT created an Apple II Plus-compatible for the European market called the ITT 2020 (Europlus). This machine was built under license from Apple. It has the same shape as the Apple II but a different color (matte silver), and is not an exact copy functionally. Syscom 2 Inc (from Carson City, NV) created the Syscom 2 Apple ][+ clone. The case looked nearly identical. They had 48k RAM and the normal expansion capabilities. These clones also supported lower case characters, toggled with a ^O keystroke. An unknown company produced a clone called the RX-8800. One new feature it had was a numeric keypad. 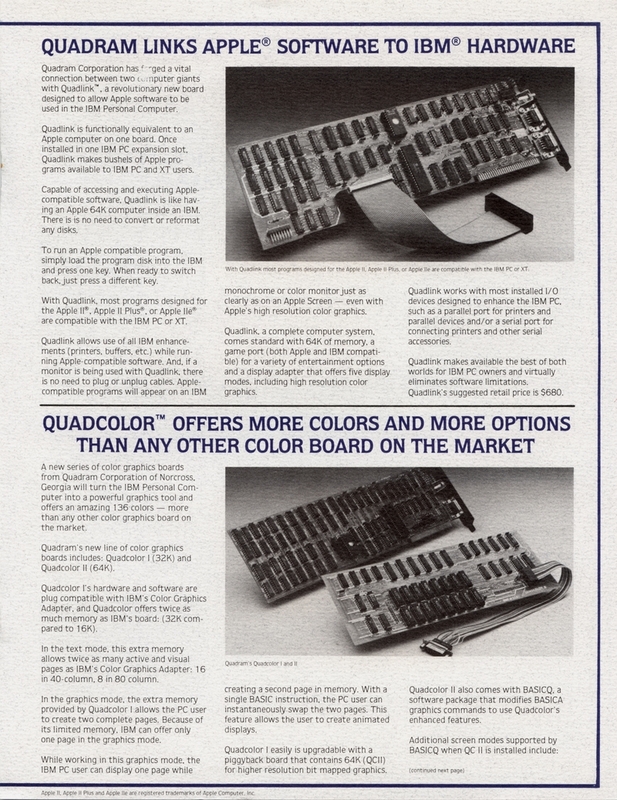 Although not technically a clone, Quadram produced an add-in ISA card, called the Quadlink, that provided hardware emulation of an Apple II+ for the IBM PC. The card had its own 6502 CPU and dedicated 80K RAM (64K for applications, plus 16K to hold a reverse-engineered Apple ROM image, loaded at boot-time), and installed "between" the PC and its floppy drive(s), color display, and speaker, in a pass-through configuration. This allowed the PC to operate in a dual-boot fashion: when booted through the Quadlink, the PC could run the majority of II software, and read and write Apple-formatted floppies through the standard PC floppy drive . Because it had a dedicated processor, rather than any form of software emulation, this system ran at nearly the same speed as an equivalent Apple machine . Another company, Diamond Computer Systems, produced a similar card called the Trackstar, that had both a 6502 and a Z80, allowing use of software for both Apple DOS and Apple CP/M. The Trackstar also had a connector allowing use of an actual Apple floppy drive, which enhanced its compatibility with software that took advantage of Apple hardware for copy-protection. Originally the Apple II used audio cassette tapes for program and data storage. A dedicated tape recorder along the lines of the Commodore Datasette was never produced; Apple recommended using the Panasonic RQ309 in some of its early printed documentation. Apple and many third-party developers made software available on tape at first, but after the Disk II became available, tape-based Apple II software essentially disappeared from the market. The Disk II floppy drive used 5¼-inch floppy disks. The first disk operating systems for the Apple II were DOS 3.1 and DOS 3.2, which stored 113.75 kB on each disk, organized into thirty-five tracks of thirteen 256-byte sectors each. After about two years, DOS 3.3 was introduced, storing 140 kB thanks to a minor firmware change on the disk controller that allowed it to store 16 sectors per track. (This upgrade was user-installable on older controllers.) After the release of DOS 3.3, the user community discontinued use of DOS 3.2 except for running legacy software. Programs that required DOS 3.2 were fairly rare; however, as DOS 3.3 was not a major architectural change aside from the number of sectors per track, a program called MUFFIN was provided with DOS 3.3 to allow users to copy files from DOS 3.2 disks to DOS 3.3 disks. On a DOS 3.x disk, tracks 0, 1, and most of track 2 were reserved to store the operating system. (It was possible, with a special utility, to reclaim most of this space for data if a disk did not need to be bootable.) A short ROM program on the disk controller had the ability to seek to track zero — which it did without regard for the read/write head's current position, resulting in the characteristic "chattering" sound of a Disk II boot, which was the read/write head hitting the rubber stop block at the end of the rail — and read and execute code from sector 0. The code contained in there would then pull in the rest of the operating system. DOS stored the disk's directory on track 17, smack in the middle of the 35-track disks, in order to reduce the average seek time to the frequently-used directory track. The directory was fixed in size and could hold a maximum of 105 files. Subdirectories were not supported. Most game publishers did not include DOS on their floppy disks, since they needed the memory it occupied more than its capabilities; instead, they often wrote their own boot loaders and read-only file systems. This also served to discourage "crackers" from snooping around in the game's copy-protection code, since the data on the disk wasn't in files that could be accessed easily. Some third-party manufacturers produced floppy drives that could write 40 tracks to most 5¼-inch disks, yielding 160 kB of storage per disk, but the format did not catch on widely, and no known software was published on 40-track media. Most drives, even Disk IIs, could write 36 tracks; simple modifications to DOS for formatting the extra track were common. Incidentally, although the Apple Disk II stored 140 kB on single-sided, "single-density" floppy disks, it was very common for Apple II users to extend the capacity of a floppy disk to 280 kB — by cutting out a second write-protect notch on the side of the disk using a "disk notcher" (although a simple hole puncher would do) and inserting the disk flipped over. Early on, diskette manufacturers routinely warned that this technique would damage the read/write head of the drives or wear out the disk faster, and these warnings were frequently repeated in magazines of the day. In practice, however, this method was an inexpensive way to store twice as much data for the same amount of money, and was widely used for commercially released floppies as well. Later, Apple IIs were able to use 3½-inch disks with a total capacity of 800 kB and hard disks. DOS 3.3 did not support these drives natively; third-party software was required, and disks larger than about 400 kB had to be split up into multiple "virtual disk volumes." ProDOS, a 1983 descendent of the Apple ///'s SOS, became the Apple II operating system of choice for users with these larger disks thanks to its native support of volumes up to 32 MB in size and the fact that AppleWorks required it. The "II" portion of the Apple II name was rendered in a variety of creative ways using stylized characters which resembled punctuation symbols on the front lids of the computers, and most printed material followed this lead. The II and II+ were labeled ][and ][plus. The IIGS and IIc Plus were rendered in small caps. The Apple ///, IIc, and IIe models used slashes: ///, //c and //e. There have been some errors in the Apple II's name due to the numerous variations and forms on the "II". Today, emulators for various Apple II models are available to run Apple II software on Mac OS X, Linux, Microsoft Windows, homebrew enabled Nintendo DS and other operating systems. Numerous disk images of Apple II software are available free over the Internet for use with these emulators. AppleWin and MESS are among the best emulators compatible with most Apple II images. The MESS emulator supports recording and playing back of Apple II emulation sessions. The Home Action Replay Page (aka HARP) allows Apple II users to archive their favorite play sessions of the Apple II system and its games. However, many emulators cannot run software on copy-protected media, or can run only software employing fairly simple protection schemes, unless it is "cracked" (copy restrictions removed). Cracked software was widely pirated in the Apple II's heyday (with commercial cracking software such as the popular Copy II+ program being sold in stores with the purpose of creating legitimate back-ups of protected software). Although creating back-ups was legitimate under copyright law of the time, the use of such software today is of questionable legality in the United States (see DMCA). For those who prefer to obtain their old software legally, the Lost Classics Project has the goal of convincing copyright holders of classic Apple II software to officially allow unrestricted free distribution of their software and has "freed" a number of programs. In addition, an active retrocomputing community of vintage Apple II collectors and users, continue to restore, maintain and develop hardware and software for daily use of these original computers. Numerous websites and support groups exist for these enthusiasts who engage in the trade and purchase for their collections, increasingly rare parts and systems. Hardly a dead platform, the Apple II has a worldwide network of kindred spirits actively engaged in preserving this otherwise outdated technology and indeed regularly attracts, new younger members who continue to keep the platform alive long after it was discontinued by Apple. The Apple II series of computers had an enormous impact on the technology industry and on everyday life. The Apple II was the first personal computer many people ever saw, and its price was within the reach of many middle-class families. Its popularity bootstrapped the entire computer game and educational software markets and began the boom in the word processor and computer printer markets. The first microcomputer "killer app" for business was VisiCalc, the earliest spreadsheet, and it ran first on the Apple II; many businesses bought Apple II's just to run VisiCalc, because it was the only spreadsheet available at the time. Apple's success in the home market inspired competitive home computers such as the VIC-20 (1980) and Commodore 64 (1982, with estimated sales between 17 and 25 million units). Through their significantly lower price point, these models introduced the computer to several tens of millions more home users. The success of the Apple II in business spurred IBM to create the IBM PC, which was then purchased by middle managers in all lines of business to run spreadsheet and word processing software, at first ported from Apple II versions; later, whole new application software dynasties would be founded on the PC. The popularity of these PCs and their clones then transformed business again with LAN applications such as e-mail and later Internet applications such as Usenet and the WWW. One valuable lesson from the Apple II was the importance of an open architecture to the success of a computer platform. The first Apple II's shipped with an Apple II Reference Manual containing a complete schematic of the entire computer's circuitry and a complete source listing of the "Monitor" ROM firmware that served as the machine's BIOS (later this guide had to be purchased separately, and in the case of the Apple IIGS, the full technical documentation ran to several volumes). The Apple II's slots, allowing any peripheral card to take control of the bus and directly access memory, enabled an independent industry of card manufacturers who together created a flood of hardware products that let users build systems that were far more powerful and useful (at a lower cost) than any competing system, most of which were not nearly as expandable and were universally proprietary. Even the game port was unusually powerful and could be used for digital and analog input and output; one hacker (Don Lancaster) used it to drive a LaserWriter printer. Apple decided not to create an open architecture with the initial Macintosh models, and this is widely seen as having hobbled its success; however, the IBM PC provides an object lesson that success for the platform does not necessarily equate to success for the company that invented it. In the end, the IBM PC's off-the-shelf, open architecture allowed clones to be manufactured by startup competitors such as Compaq, Dell and Gateway, leading to a Pyrrhic victory for IBM. In December 2004, IBM confirmed it had sold its personal computer division including all computer models and technology to Lenovo in the People's Republic of China for US$1.75 billion. ^ Forster, Winnie (2005). The encyclopedia of consoles, handhelds & home computers 1972 - 2005. GAMEPLAN. p. 18. ISBN 3-00-015359-4. ^ Chris Cavanaugh (May 2004). "Apple II Biography". http://www.allgame.com/platform.php?id=6. Retrieved 2009-10-07. ^ Wilson Rothman (2009-07-19). "Apple II: The World Catches On". http://www.gizmodo.com.au/2009/07/apple-ii-the-world-catches-on/. Retrieved 2009-10-07. ^ Mary Bellis. "The First Spreadsheet". http://inventors.about.com/library/weekly/aa010199.htm. Retrieved 2009-10-07. ^ a b Petersen, Marty (6 February 1984). "Review: Premium Softcard IIe". InfoWorld (InfoWorld Media Group) (Vol. 6, Num. 6): 64. "Several manufacturers, however, make Z80 coprocessor boards that plug into the Apple II.". ^ "June 5, 1977: From a Little Apple a Mighty Industry Grows". June 5, 2007. http://www.wired.com/science/discoveries/news/2007/06/dayintech_0605. Retrieved 2009-06-02. ^ Forster, Winnie (2005). The encyclopedia of consoles, handhelds & home computers 1972 - 2005. GAMEPLAN. p. 19. ISBN 3-00-015359-4. ^ Steven Weyhrich (April 21, 2002). "Apple II History Chapter 4". http://apple2history.org/history/ah04.html. Retrieved 2006-11-16. ^ Rose, Frank (1989). West of Eden. Arrow Books. pp. pg. 3. ISBN 0-09-976200-5. ^ Steven Weyhrich (December 28, 2001). "Apple II History Chapter 5, The Disk II". http://apple2history.org/history/ah05.html. Retrieved 2006-11-16. ^ Gibson, Steve. "The origins of sub-pixel font rendering". http://www.grc.com/ctwho.htm. Retrieved 2006-08-04. ^ Petersen, Marty (6 February 1984). "Review: Premium Softcard IIe". InfoWorld (InfoWorld Media Group) (Vol. 6, Num. 6): 64. "Several manufacturers, however, make Z80 coprocessor boards that plug into the Apple II.". ^ "The development of small computer geographic analysis systems for military applications". http://training.esri.com/campus/library/Bibliography/RecordDetail.cfm?ID=16159. ^ "Moving Maps: Evolution in GIS". http://www.falconview.org/trac/FalconView/raw-attachment/wiki/Presentations/Moving_Maps.pdf. ^ "U.S. Army Field Manual 34-3, Intelligence Analysis". http://www.fas.org/irp/doddir/army/fm34_3.pdf. ^ Regan, Joe. A2Pro Roundtable, October 1991, Category 16, Topic 2. ^ a b Duprau, Jeanne, and Tyson, Molly. "The Making of the Apple IIGS", A+ Magazine, November 1986: 57-74. ^ Old-Computers.com Museum. "Apple IIGS". http://www.old-computers.com/museum/computer.asp?c=71. Retrieved 2006-11-16. ^ "An 'Unknown' Co-Founder Leaves After 20 Years of Glory and Turmoil". New York Times. 1997-09-01. http://www.nytimes.com/1997/09/01/business/an-unknown-co-founder-leaves-after-20-years-of-glory-and-turmoil.html. ^ "Quadlink by Quadram - put an Apple II in you PC". http://www.classiccmp.org/pipermail/cctech/2005-January/037465.html. Retrieved 2009-12-16. ^ "Quadram Quips (sales flyer)". Quadram. http://www.textfiles.com/digitize/items/1984-quadram-quips/.m/1984-quadram-quips-03.jpg. Retrieved 2009-12-16. ^ Arrants, Stephen (December 1983). "The new blue Apple; Quadlink makes your IBM think it's an Apple". Creative Computing. http://www.atarimagazines.com/creative/v9n12/53_The_new_blue_Apple_Quadl.php. Retrieved 2009-12-16. ^ Lombardi, John V (1983). "Review: Quadlink". Infoworld. http://books.google.com/books?id=wS8EAAAAMBAJ&pg=PA87&lpg=PA87&dq=quadram+quadlink&source=bl&ots=odmt8aryni&sig=veDXvPkL5xcywR8fROPK5xAX3wg&hl=en&ei=HgwpS4GdJoKBnQen2MGkDQ&sa=X&oi=book_result&ct=result&resnum=9&ved=0CCAQ6AEwCA#v=onepage&q=quadram%20quadlink&f=false. Retrieved 2009-12-16. ^ Lockwood, Russ (November 1985). "Build a better computer; a look at some new, interesting, and affordable additions for your IBM PC". Creative Computing. http://www.atarimagazines.com/creative/v11n11/67_Build_a_better_computer_.php. Retrieved 2009-12-16. Wozniak, Steve (May 1977). "System Description: The Apple II". Byte. http://oldcomputers.net/byteappleII.html. 16Sector.com Apple II hardware production - FocusDrive and SiriusRAM GS. WEB page of an Apple IIe user Some cards detailed and programs to download. See also: Apple hardware since 1998. For the GS model, see Category:Apple IIGS. The Apple II (often rendered or written as Apple ][ or Apple //) was the first highly successful mass produced microcomputer product manufactured by Apple Computer (now Apple Inc.) and introduced in 1977. It was among the first home computers on the market, and became one of the most recognizable and successful. In terms of ease of use, features and expandability the Apple II was a major technological advancement over its predecessor, the Apple I, a limited production bare circuit board computer for electronics hobbyists which pioneered many features that made the Apple II a commercial success. Introduced at the West Coast Computer Faire in 1977, the Apple II was among the first successful personal computers and responsible for launching the Apple company into a successful business. Throughout the years a number of different models were introduced and sold, with the most popular model manufactured having relatively minor changes even into the 1990s. By the end of its production in 1993, somewhere between five and six million Apple II series computers (including approximately 1.25 million Apple IIGS models) had been produced. Pages in category "Apple II"
The Apple II family was a series of computers designed and manufactured by Apple Computer. They used 6502 microprocessors. Apple's first attempt to make a laptop. Had stunning graphics and sound quality at the time. This article uses material from the "Apple II" article on the Gaming wiki at Wikia and is licensed under the Creative Commons Attribution-Share Alike License.